Jody Williams Traylor of Jody Lynn Photography has been photographing newborns, children and families in the local area for over ten years. Coming from a technical background in Information Technology, Jody decided to go the complete opposite route and get creative with photography. They say if you love what you do you never work a day in your life and she believes that 100%. Jody loves to find the pure joy in a child and photograph that. Even though you’ll often find Jody tickling or acting silly to get the cutest reactions from her little subjects, she believes the real moments are the in-between moments. Like that moment right before a child laughs when their face lights up or right after when they are filled with joy. Ben Traylor, of Ben Traylor Productions, offers video production services in the area. Ben specializes in corporate and broadcast work. At CLICK Photography Studio, we will offer not only photography and video production, but also photography workshops. While our storefront is new, CLICK is not new to us. 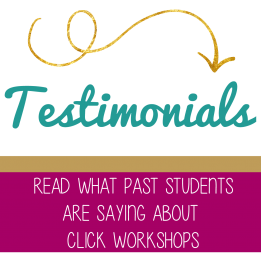 Jody has been teaching CLICK workshops for the last 9 years in the Atlanta area. Would you like to learn how to use your camera better? Is the camera manual a little hard to follow? A CLICK workshop might just be the thing for you. We teach you the most important basics in an easy to follow hands-on format. © 2019 Photography Studios in Atlanta | Click Photography Studio|ProPhoto Photography Theme Designed with love by Seaside Creative.